10 Drop Static Meshes to Nearest Surface! 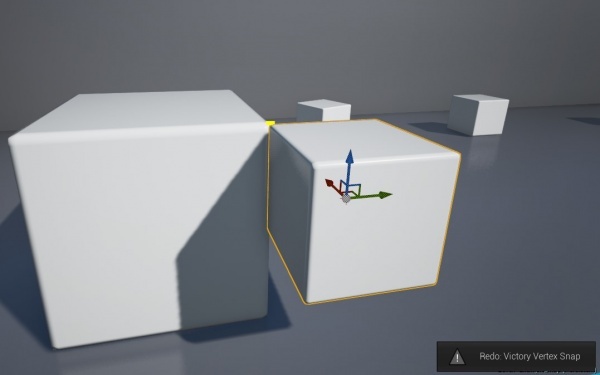 Here is my Vertex Snapping UE4 Editor Plugin! 3. My very own Vertex Snapping Editor Mode, showing you via complete example how you can make your own Editor Modes! My Entire C++ Source Code For You! Because of the wiki file size limit of 20mb I am compelled to unify my Victory Plugin distribution into Editor + Packaged Binaries only in a media fire download from now on. Entire C++ Source code is included! I include media fire links in the file description for more recent engine verisons! You should install my Victory Plugin in the Engine/Plugins/Runtime folder of the appropriate Engine version. You should always try to package for Development Win64 first, and Shipping Win32 as these are the only two platforms I support for those who do not have C++ access. 1. download my editor / BP plugin and put in a directory directly off of your main project directory called "Plugins"
What does this all do? 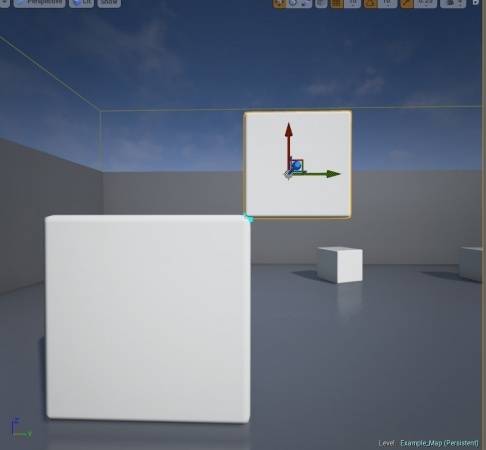 My plugin includes an alternative UnrealEdEngine class, that makes use of my new additional FEdMode editor mode class. The config file tells the main UE4 binary to use my alternative UnrealEdEngine class instead of the default. Commenting out the line you added will instantly disable my Editor Mode. is pretty much guaranteed to cause a crash. To disable my editor mode you should *always* comment out the DefaultEngine.ini line first!
" Help I can't Load UE4 Anymore "
and it will crash if you try cause it can't find the new Engine class. But, this is extremely easy to fix! I recently added a feature so that you can select many static mesh actors that all have the same static mesh and convert them into 1 instanced static mesh! This process can be reversed at any time to make individual edits! In this way you can enable UE4 to render 1000s of static meshes while maintaining very high FPS! 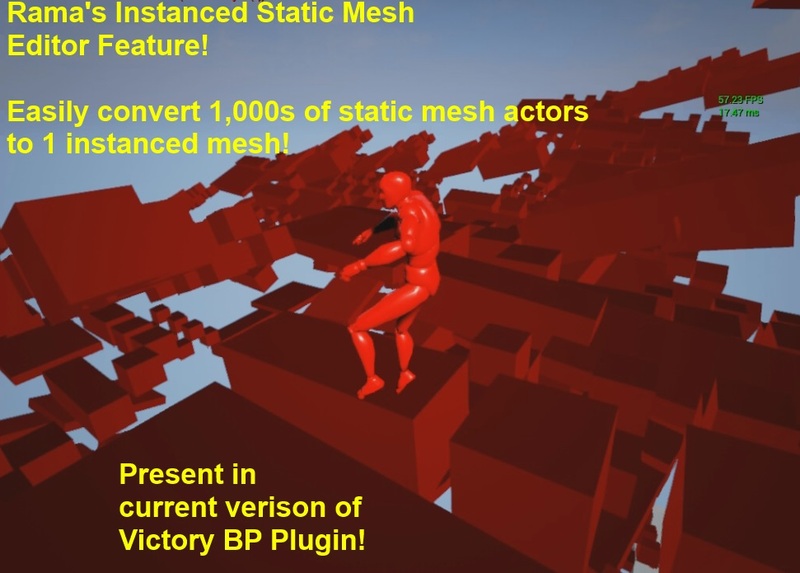 Now you can edit instanced static meshes with all the tools you are familiar with and convert all the static mesh actors when you are done, to get a huge FPS boost! To make my Instanced Static Mesh system work with your project you have to choose a ISM actor class. You can either create your own by adding a Instanced Static Mesh Actor to a new Actor blueprint, making the ISM component the root component, or you can use the VictoryISM class in my Victory BP Library plugin! My Vertex Snap Editor Mode now works with UE4's undo system! You can undo as many individual snap events as you want! Note that I only save an undo state when you release the V key to avoid flooding the system while you are continuously snapping while holding down V.
Now pressing the U key is a display toggle! Drop Static Meshes to Nearest Surface! to drop the selected Static Mesh or Static Meshes to the nearest surface in the level! You can drop Static Meshes down to each other too! My algorithm takes into account the actual shape of the static mesh being dropped, as well as the landscape/level/meshes it is being dropped onto! If you have multiple objects selected, they are treated as one big object and all the surfaces are calculated together, and the group is dropped, maintaining formation, to the nearest surface within your level. My extended Editor Engine detects when the user clicks on a static mesh actor, and activates my Vertex Snapping Editor Mode. This is my very first new Editor Mode for the main UE4 Editor! This is a tiny ( under 10 MB ) plugin, that you can download and use without having to compile any source code. Your project does not have to be a code-based project! 1. Toggle instantly moving selected static meshes to the mouse cursor, to quickly move them around, or "teleport" them across the map, supports Multi Selection. -you can toggle vertex displaying by pressing Y. All of the features are related to static mesh actors and my editor mode disables itself if you are not working with a static mesh actor. It is super easy to enable or disable my editor mode, or suspend it entirely after trying it out. With my editor mode plugin you can enjoy some new features for your UE4 Editor Experience! -Hold SHIFT while selecting the second vertex to use Snap-By-Surface-Normal, which will try to align the source static mesh actor with the surface of the destination actor. -can do whole process with 3 input key presses total! You can move/rotate the selected static mesh actor after selecting one of its verticies, and the selection will be maintained and updated. my editor mode automatically highlights all of the vertices and the vertex that is closest to the cursor. Why not use Mouse Click? In case you are curious, I am drawing directly to the PDI, the fundamental drawing surface, using DrawPoint. An advantage of using PDI and DrawPoint is that only verticies in the chosen depth priority will draw. This enables me to hide verticies that you would not realistically want to click on from the opposite side of a mesh. the move/rotate/scale main editor widget disappears to let you know you are in that mode and also because it is not really usable while using the T-key mode. -Deselecting or exiting the mode cancels the Instant T(ranslate) key mode. If you are using Align-By-Surface-Normal, the selected static mesh will attempt to orient itself to the surface closest to the vertex of the other static mesh. There is not actually any 3D collision for the verticies! I defined a "button" struct which stores the projected coordinates of the verticies, plus the resizable drawn-vertex scaling. So as you scale the verticies the buttons grow to accommodate. Whenever the view changes, the buttons are freshed. Have fun with my editor mode! Feel free to use my C++ code as an outline for making your own Editor Mode Plugin! Just please give me credit somewhere appropriate. I wrote all the code myself and just used Epic's awesome UE4 Beta .h files as a reference. This code does not contain any UE4 C++ source code, as I did not have access to it when I wrote this plugin. //Proper way to make a shared ref ??? Since the EdMode is a pure C++ class, it must go in the Public directory of your plugin file structure! * Lets the mode determine if it wants to draw the widget or not. //			PROCESS MOUSE INSTANT MOVE? //		Move the Primary, the Origin! //Match rotation of owner of target vertex? //Highlight Vertex if hovered over! //Vertex Selected and not same? The key interaction between the Editor Mode class and the extended Unreal Engine class is in the Unreal Engine class, where it creates the editor mode instance. I hope that providing you with my entire Vertex Snapping C++ Source code helps you to create your own Editor Plugins!